Once you insulate your machines, you will start seeing immediate energy savings. But the payoffs don’t end there—countless other applications can also benefit from insulation. At UniTherm, we’ve designed solutions that not only fit your machines, but your dryer hoses and process pipes as well. Shop our standard product line. ThermaSleeve by UniTherm is custom manufactured to insulate your silicone dryer lines to lower heat loss and conserve energy. Insulating your material dryer lines with ThermaSleeve allows a drying system to run up to 50% more efficiently. For most energy rebate programs, dryer hose insulation is a prescriptive product, which decreases project approval time. UniTherm is the proprietor of IsoRock® the insulating component of ThermaSleeve. IsoRock® is a non-combustible thermal insulator. This insulator conforms easily and adequately to all machines. OSHA requires heated surfaces be no more than 120°F for employee safety. Our removable insulation jackets easily reduce surface temperatures to meet this requirement. For example, a hose operating at 350°F will have a surface temperature of 93°F with valve insulation installed. A: ThermaSleeve hose and pipe insulation comes in several standard adjustable diameters. First, determine your diameter and then order the quantity needed accordingly. Q: Do I need to have a professional come in and install ThermaSleeve? A: No, ThermaSleeve hose and pipe insulation products do not require a professional for installation. ThermaSleeve does not require a professional or tools to install the product on your application. 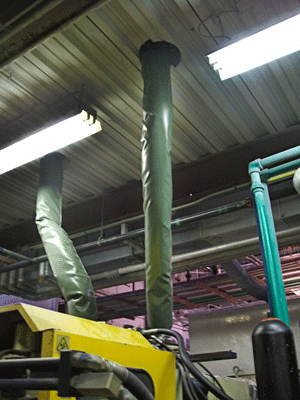 Q: Who would typically use ThermaSleeve removable hose and pipe insulation? A: If the application or process is over a 100 ft. then ThermaSleeve would be a great product for the job. Our products are typically installed on pellet delivery systems, hot oil pipes, steam systems, and a variety of other applications that require the process to be maintained.